The triple-encored, 100-minute concert Mazzy Star gave Toronto’s Danforth Music Hall on Nov. 16 was definitely one it will have to live up to next time (and Hope Sandoval sort of promised a next time). The first audiences that received Mazzy Star in the late 1980s and throughout the ’90s met it as a band that wed the devices of alternative rock’s then-contemporary vanguards with a minimalist version of psychedelic rock and the longstanding traditions of folk and bluegrass. They were champions of a gaping melting pot, and that melting pot sounded sweet – pun intended. But in spite of the darling status Mazzy Star’s music earned, it wasn’t long after the band drifted into the public arena (and arenas) when audiences could decipher how the engrossing atmospheres the band was concerned with producing sonically didn’t make accommodations for rabid fans or snap-happy photographers. While Hope Sandoval’s narcotic pouts are prominent across the band’s catalogue, the singer displayed an early aversion to the spotlight: notoriously introverted onstage, Sandoval would rarely interact with fans, and the band responded to her hesitancies by playing in near-darkness. successful concerts ride on so much more than physical presentation. And that is especially true for reactivated bands bringing new albums in tow. So when security warned Toronto fans lined up early for the concert of a strict policy against camera and cell phone use in effect for the night (they instructed fans that simply must send text messages do so from the hall’s lobby), most accepted the band’s negotiation of modern “Instagram everything” concert culture as par for the course. But clichéd discussions describing Mazzy Star’s set as “a blast from the past” or “an indication that absence makes the heart grow fonder” would fail to recognize that what Mazzy Star brought to the table was so much more than a validation of long-whetted nostalgia. Candlelit and flanked by a wash of purple backlights, the intimate stage awaiting fans inside the Danforth was enchantingly reminiscent of the MTV Unplugged concerts other bands played in Mazzy Star’s heyday (especially Nirvana’s, which turns 20 this week) – another thing the cell phone ban helped facilitate – but successful concerts ride on so much more than physical presentation. And that is especially true for reactivated bands bringing new albums in tow. Although they held off on revealing any proof of it until two years after Hope Sandoval teased it to Rolling Stone in 2009 when doing press behind her solo project with The Warm Inventions, Mazzy Star and its Sept. 24-released Seasons of Your Day has been in gestation since 1997. Even if you walked into the show knowing this and you hadn’t heard any of Seasons of Your Day (which would be your own fault, given that almost a third of it was issued ahead of the album over the double A-side “Common Burn” / “Lay Myself Down” single in 2011 and then the video for “California” in August this year), you might have been surprised by how well the new material works with the old. In fact, you were sort of forced to realize it when Mazzy Star opened with successive double representations of the releases that chronologically bracket their 2000-interrupted 1997-2010 hiatus: “Look on Down from the Bridge” and “Cry, Cry” from Among My Swan, and Seasons of Your Day cuts “In the Kingdom” and “Lay Myself Down.” (Full setlist below.) Placing these specific selections at the top of the setlist was actually sort of genius, really. It meant that in the first 15 minutes, Mazzy Star played the final song on Among My Swan and the opening track on Seasons of Your day, effectually serving fans a naked reminder of (first) exactly where they left off, and (second) how the band’s general dedication to continuity shines through from the very beginning of its new record. It also made fans take in the shear cohesion of Mazzy Star’s musicianship. The organ-prominent “Look on Down from the Bridge” and “In the Kingdom” forced fans to soak in perhaps-underappreciated keyboardist Suki Ewers’s skills, while the chord-restrained minimalism of “Cry, Cry” and “Lay Myself Down” might have persuaded guitar geeks craving the incendiary impressionism of psychedelic rabbit holes like “She Hangs Brightly” to turn their intention instead to pedal steel player Josh Yenne and his mournful bottleneck gliding. And if you weren’t close enough to take in the finer details of the stage’s goings-on, there were always the projections of starry skies, stormy seas, and vintage photos to feast your eyes on as Mazzy Star cranked out its smoldering themes for lucid somnambulism all night long. The whole set was a thing of delicate balance, with an especially memorable presentation of “Into Dust” at its centerpiece. Personnelled just by Sandoval on vocals, Roback on an acoustic guitar, and the bassist for the night (Seasons of Your Day features My Bloody Valentine drummer and Hope Sandoval’s Warm Inventions bandmate Colm Ó Cíosóig on bass and Cíosóig continues to receive credit as the band’s bassist, but MBV’s recently concluded tour and Mazzy Star’s current one overlapped significantly, so who this was is anyone’s guess [update: Mazzy Star drummer Keith Mitchell has confirmed the bassist and violist for the night was his son, Paul Mitchell]) on violin, it permeated ambience so still you could hear whispered interactions from the Danforth’s bar. The intimate performance – and the night in general – was arguably made even better by the general respect fans demonstrated by heeding to the band’s wishes surrounding photography. The band certainly seemed to appreciate it, too. Although they denied fans a performance of Seasons of Your Day closer “Flying Low” – a track that’s closed the regular set portions of most of this tour’s recent setlists – what the band provided in the aftermath did more than make up for it, returning for not one, not two, but three encores. When the band reached the coda of the heavily improvised, Richard Wright-like keyboarded rendition of the song, Sandoval approached the mic to give what was perhaps the most stage banter she’s ever given. Regardless of whether or not that’s true, I hope she follows up on it. This entry was posted in Burden of Salt and tagged Danforth Music Hall, David Roback, Hope Sandoval, Mazzy Star, reunion, Rock Section, Seasons of Your Day, setlist, Toronto, tour on November 19, 2013 by Tom Beedham. Such an amazing show. 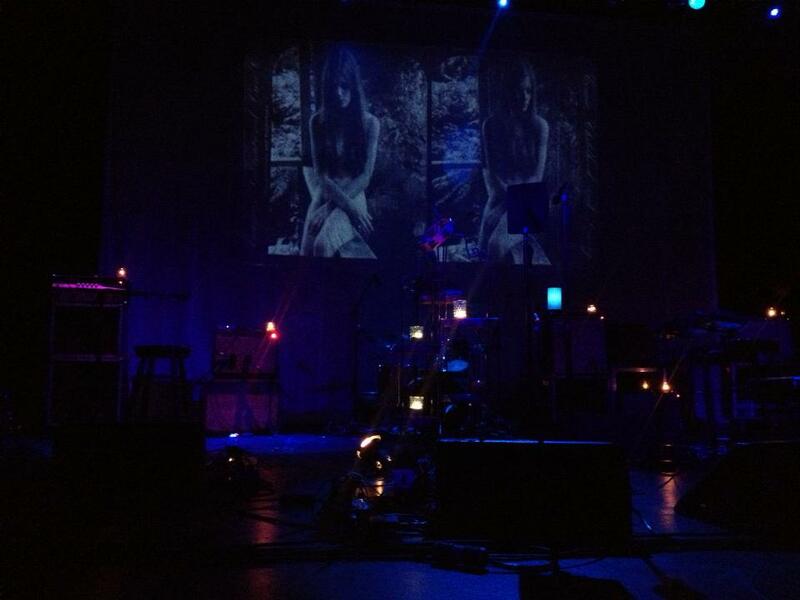 This was my first time seeing Mazzy Star, even though I’ve been a fan forever. After the second encore, Mitchell looked like he wanted to keep playing, but everyone else walked off stage. He lingered, held up his finger like he was saying one more, and then went off stage. And then they came back out. I got the impression that Hope wasn’t really that in to it, especially since she walked back off stage before the song ended. But it was still awesome to see an hear. The bassest and violist for that show was my son, Paul Mitchell. I’m glad you enjoyed the show. Keith Mitchell, I’m on FaceBook!